(26) [Brahmâ continued:] 'When the sages [headed by Sanaka] by dint of their spiritual potency reached Vaikunthha, they experienced a transcendental ecstasy they never had experienced before. It was the place, radiating with the palaces of the most deserving and learned devotees, where the teacher of the universe rules who is the object of worship in all the worlds. (27) After passing there through six gates without taking much interest, they at the seventh gate ran into two demigods of the same age who carried valuable maces, bracelets, earrings, helmets and beautiful garments. (28) Placed around their necks there was, between their four blue arms, a garland of forest flowers with intoxicated bees around them. But looking about with their arched eyebrows, restless breathing and reddish eyes, they seemed somewhat agitated. (29) Seeing them both standing at the gate, the sons of Brahmâ passed, as they did before, the golden and diamond doors without taking any notice. They, after all, were the great sages who of their own accord moved everywhere without being checked or doubted. (30) When they saw them, four naked boys of age who had realized the truth of the self but who looked as if they were not older than five years, the two gatekeepers in disregard of the glory and the etiquette, in an attitude offensive to the Lord wrongfully blocked their way with their staffs. (31) The moment they were faced with the slight hindrance of the two doorkeepers who, for all the inhabitants of Vaikunthha to see, refused them despite by far being the fittest of the Lord, their eyes, in their eagerness to see their most beloved one, suddenly turned red out of anger ['the younger brother of lust']. (37) That very moment the Supreme Lord, from whose navel the lotus sprouted, learned about the offense against the righteous sages. To their delight He came to the place being accompanied by His Goddess of Fortune, walking on the very same lotus feet that are sought by the hermits and the wise. (38) Seeing Him coming forward with all His associates and paraphernalia, the sages, now seeing the one whom they always had been looking for, fell into ecstasy over the sight of the câmaras [fans of yak-tail] that like beautiful swans waved a cool breeze that moved the pearls of His white umbrella, making them look like drops of water to a reflected moon. (39) Blessing all with His auspicious face as the desirable shelter, He affectionately looked upon them and touched them expanding in their hearts. With His blackish skin and His broad chest decorated by the Goddess of Fortune, He spread the good fortune as the culmination of the spiritual worlds and the abode of the soul. (40) Covered by yellow cloth He had a brightly shining girdle around His hips and humming bees about His garland of forest flowers. On His wrists He had lovely bracelets and while one of His hands rested on the shoulder of the son of Vinatâ [Garuda], He waved a lotus flower with another one. (41) Shining brighter than lightening, the decoration of His alligator shaped earrings completed the countenance of His cheeks and straight nose. He wore a gem-studded crown, carried a charming most precious necklace between His stout arms and the Kaustubha jewel adorned His neck. (42) With His beautiful decoration meditated upon by His fully attentive devotees, He outshone the smiles of the Goddess of Beauty. The sages could not get enough of the sight of the very beautiful figure so worshipable for me and for S'iva as also for all of you, and that made them joyously bow down their heads. (43) When the breeze, carrying the fragrance of tulsî leaves from the toes of the lotus feet of the lotus-eyed Lord, entered their nostrils, they experienced an inner transformation, even though they in body and mind were devoted to [the impersonal realization of] Brahman. (44) Thereafter looking up they saw His face that resembled the inside of a blue lotus and also saw His even more beautiful jasmine flower lips smiling. Thus having achieved their life's aim they again looked down at the ruby red nails of His lotus feet and then meditated upon their shelter. (45) For those people who seek liberation in this world by the paths of yoga, He is the object of meditation approved by many. With the display of His human form pleasing the eyes He, eternally present, is praised as endowed with the perfection of the eight achievements, a perfection that cannot be achieved by others [the so-called eight perfections or siddhis are: animâ: smallness, mahimâ: greatness, garimâ: weight, laghimâ: lightness, prâpti: free access, prâkâmyam: doing at wish, vas'itva: control over the elements and îs'itvam: lordship over all]. Third revised edition, loaded Januari 27, 2017. Maitreya said: 'Diti was afraid that she by the power of [the seed of] the great Prajâpati for the time of a century would destroy the power of others and distress the God-fearing people. The world was deprived of light because of this [threat] and thus the local authorities who saw their power diminished consulted with the creator of the universe [Lord Brahmâ] about the darkness that expanded in all directions. Oh god of gods, sustainer of the universe, you as the crown jewel of all the guardians of the spiritual and material worlds know about the intentions of all living beings. We offer you whose strength is found in wisdom our obeisances. Having obtained this body composed of external energy and in acceptance of your distinguished mode [of passion], we pay you our respects, oh unseen source. Those who are steadfast in their devotion meditate upon you, the origin of all beings, the absolute consisting of the true and untrue and the self in which all worlds are connected. For souls who are mature in the practice of yoga and have attained your mercy in controlling their senses and mind by means of their breath, there is no defeat in any way. Him whose directions are the lead for all living entities the way a rope is the lead for a bull, him under whose authority offerings are presented, that most important personality, you, we offer our obeisances. Because of this darkness we cannot get around to our prescribed duties. We ask you to act to our good fortune, oh great Lord, please grant us, surrendered souls, the magnanimous mercy of your glance. Maitreya said: 'Oh mighty-armed one, he, the self-born one who in the prayers was addressed as the Supreme Lord, with a smile satisfied the demigods and gave a reply in sweet words. Brahmâ said: 'They who before you were born from my mind and are headed by Sanaka [Sanâtana, Sanandana en Sanat-kumâra], traveled free from expectations the distances between the people of the spiritual and material worlds. Free from all material contamination they one day entered Vaikunthha, the eternal abode of Vishnu, the Supreme Lord, the realm for which one prays in all the worlds. All the persons living there have the same form as the Lord of Vaikunthha and live free from any desire because of their devotional service of continuously worshiping the Supreme Personality. The Lord of all Fortune, the original person who is understood through the scriptures, dwells there as the personification of the religious principles in order to accept in His goodness our purity to the greater happiness of us who belong to Him. In that realm where everything is spiritual and personal, there are forests that for the sake of happiness yield to all desires with [desire] trees full of splendid flowers and fruits throughout all the seasons. Living in palaces with their wives, the devotees free from all inauspicious qualities are always singing there about the Supreme Lord, while being critical about the by the wind wafted mind-blowing fragrance of the mâdhavî flowers that full of nectar are blossoming in the water. When the king of the bumblebees loudly sings the glories of the Lord, the tumult of the pigeons, cuckoos, cranes, cakravâkas and gallinules, swans, parrots, partridges and peacocks stops for a while. The fragrant mandâra, kunda, kurabaka, utpala, campaka, arna, punnâga, nâgakes'ara, bakula, lily and pârijâta, all agree that the tulsî plant [the basil plant the Lord adorns Himself with and] which in the form of a garland is appreciated [by Him] for her smell, best of them all honors the good spirit of renunciation there. By simply being of obeisance to the Lord's feet, the devotees earned the palaces standing everywhere, made of lapis lazuli with emeralds and gold, whose [female] inhabitants have large hips and beautiful smiling faces. But with their friendly laughing and joking, they, spiritually absorbed in Krishna, never give rise to any lust. In that house of the Lord [sometimes], reflected in the crystal clear walls inlaid with gold, the Goddess of Fortune is seen who is free from all faults. She then assumes a beautiful form with tinkling [bangles at her] feet and playing with a lotus flower. That grace of her is something for which the other ladies manifest themselves with the greatest zeal as true scrubwomen. Surrounded by maidservants they in their gardens on coral banks to ponds with pellucid, nectarean water, offer tulsî leaves to the Supreme Lord. Seeing the beauty of the locks of the goddess reflected in the water, they thereby imagine the Lord kissing her face. How unfortunate are they who never attain this Vaikunthha creation of the Vanquisher of All Sin, but rather hear about other subject matters phrased in bad words that kill one's intelligence. Alas, such persons far removed from the values of life are devoid of all shelter and cast into the deepest darkness. They who realized the human way of life, who acquired knowledge about the Absolute and are of the proper code of conduct [dharma] the way we [Lord Brahmâ and the demigods] wish it, but do not succeed in propitiating the Supreme Lord, are alas bewildered by His omnipresent illusory energy. [Brahmâ continued:] 'When the sages [headed by Sanaka] by dint of their spiritual potency reached Vaikunthha, they experienced a transcendental ecstasy they never had experienced before. It was the place, radiating with the palaces of the most deserving and learned devotees, where the teacher of the universe rules who is the object of worship in all the worlds. After passing there through six gates without taking much interest, they at the seventh gate ran into two demigods of the same age who carried valuable maces, bracelets, earrings, helmets and beautiful garments. Placed around their necks there was, between their four blue arms, a garland of forest flowers with intoxicated bees around them. But looking about with their arched eyebrows, restless breathing and reddish eyes, they seemed somewhat agitated. Seeing them both standing at the gate, the sons of Brahmâ passed, as they did before, the golden and diamond doors without taking any notice. They after all, were the great sages who of their own accord moved everywhere without being checked or doubted. When they saw them, four naked boys of age who had realized the truth of the self but who looked as if they were not older than five years, the two gatekeepers in disregard of the glory and the etiquette, in an attitude offensive to the Lord wrongfully blocked their way with their staffs. The moment they were faced with the slight hindrance of the two doorkeepers who, for all the inhabitants of Vaikunthha to see, refused them despite by far being the fittest of the Lord, their eyes, in their eagerness to see their most beloved one, suddenly turned red out of anger ['the younger brother of lust']. The sages said: 'Who are the two of you, to have attained here the service of the Supreme Lord by dint of your actions in the past? Which devotee who in Him is without anxiety and enmity, can be engaged as false as you? Who in the world is of such a deceptive mentality like yours that betrays the confidence? No one here is strange to the Supreme Personality who contains all in His abdomen. The living entity has its place in the Supersoul the way the small portion of air in one's lungs is part of the air outside. As a sober person seeing the two of you being dressed up like inhabitants of Vaikunthha, like awakened people who discriminate between body and soul, one wonders how such a fear about Him can exist? The two [doorkeepers] who understood that a terrible brahmin curse had been pronounced by them, a curse that cannot be countered by any weapon, at once stricken with fear for the devotees of the Lord fell down to grasp their feet in great anxiety. That very moment the Supreme Lord, from whose navel the lotus sprouted, learned about the offense against the righteous sages. To their delight He came to the place being accompanied by His Goddess of Fortune, walking on the very same lotus feet that are sought by the hermits and the wise. Seeing Him coming forward with all His associates and paraphernalia, the sages, now seeing the one whom they always had been looking for, fell into ecstasy over the sight of the câmaras [fans of yak-tail] that like beautiful swans waved a cool breeze that moved the pearls of His white umbrella, making them look like drops of water to a reflected moon. Blessing all with His auspicious face as the desirable shelter, He affectionately looked upon them and touched them expanding in their hearts. With His blackish skin and His broad chest decorated by the Goddess of Fortune, He spread the good fortune as the culmination of the spiritual worlds and the abode of the soul. Covered by yellow cloth He had a brightly shining girdle around His hips and humming bees about His garland of forest flowers. On His wrists He had lovely bracelets and while one of His hands rested on the shoulder of the son of Vinatâ [Garuda], He waved a lotus flower with another one. Shining brighter than lightening, the decoration of His alligator shaped earrings completed the countenance of His cheeks and straight nose. He wore a gem-studded crown, carried a charming most precious necklace between His stout arms and the Kaustubha jewel adorned His neck. With His beautiful decoration meditated upon by His fully attentive devotees, He outshone the smiles of the Goddess of Beauty. The sages could not get enough of the sight of the very beautiful figure so worshipable for me and for S'iva as also for all of you, and that made them joyously bow down their heads. When the breeze, carrying the fragrance of tulsî leaves from the toes of the lotus feet of the lotus-eyed Lord, entered their nostrils, they experienced an inner transformation, even though they in body and mind were devoted to [the impersonal realization of] Brahman. Thereafter looking up they saw His face that resembled the inside of a blue lotus and also saw His even more beautiful jasmine flower lips smiling. Thus having achieved their life's aim they again looked down at the ruby-red nails of His lotus feet and then meditated upon their shelter. For those people who seek liberation in this world by the paths of yoga, He is the object of meditation approved by many. With the display of His human form pleasing the eyes He, eternally present, is praised as endowed with the perfection of the eight achievements, a perfection that cannot be achieved by others [the so-called eight perfections or siddhis are: animâ: smallness, mahimâ: greatness, garimâ: weight, laghimâ: lightness, prâpti: free access, prâkâmyam: doing at wish, vas'itva: control over the elements and îs'itvam: lordship over all]. The Kumâras said: 'Even though You are seated in the heart, You are not manifest to those who are far removed from the soul. Today, oh Unlimited One, we see You face to face, You who through our ears reached our inner being when we heard our father [Brahmâ] describe the mysteries of Your appearance. You, oh Supreme Lord, who with Your personality consisting of pure goodness brings delight to all [who are like us], we now know as the ultimate reality of the soul. This reality one may, according to the understanding of the sages who are not interested in a material life, grasp by Your grace in steadfast devotional service with a heart free from attachments. They [who follow this practice] do not even care about Your imperishable beatitude [kaivalya, enlightenment] or about any other minor form of happiness with which they may fear the frowning of Your eyebrows. They, oh Supreme One, take shelter of Your lotus feet and the narrations about Your pure glories so worthy to be sung by the very expert knowers of Your rasas [the emotional mellows one may have with You]. From the falsity of the lives we desired we may be of low births and have minds busy like bees, but if we are engaged in the devotional service at Your lotus feet and fill our ears with Your transcendental qualities, our words used become as beautiful as the tulsî leaves of Your mercy. We obtained so much satisfaction from seeing this eternal form You manifested, oh Lord of great renown. Let us therefore offer our obeisances to You, the Supreme Personality of Godhead, the Lord who is recognized by spiritual persons like us and not by those who are not spiritual. 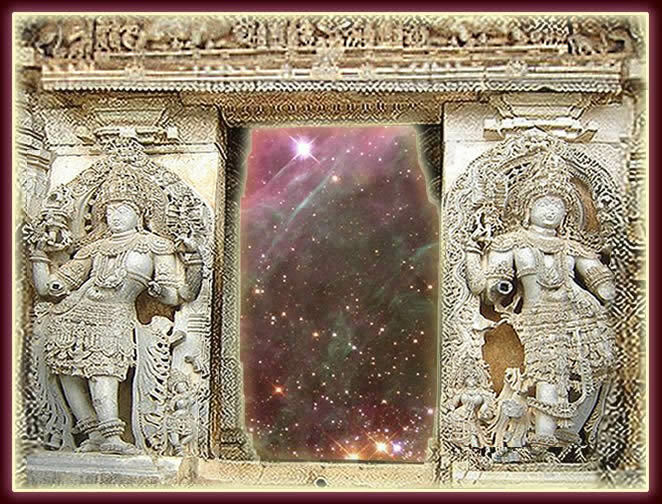 The fair use based picture titled "Gate to Vaikunthha"
is a blend by Anand Aadhar of two pictures. the second is a Hubble telescope picture of the Tarantula Nebula.